Like most gardening, growing fruits and vegetables is a collaboration between plant and gardener. Tomatoes, for example, “know” what they need to do to make great tomatoes, and once in the ground, they do most of the work of transforming sunshine, water, and soil nutrients into the sugars and acids that give them their delicious sweet-tangy flavor. The gardener’s job is to help create the conditions that plants need to do their work, like providing sufficient water and maintaining soil fertility. In most of the Pacific Northwest (with its cool nights and possibility of fall rains), it may also mean staking and pruning plants to ensure adequate space, sun, and air circulation. Whether to stake, trellis, or cage tomato plants depends on what kind of tomatoes you’re growing, how much space you have, how much time you want to spend, and whether you prefer harvesting lots of imperfect tomatoes or fewer but larger, prettier, and possibly better tasting fruits. Determinate varieties usually grow only 3 or 4 feet tall, and many sources say supports aren’t necessary for these bushier, sturdier plants. However, a short stake or cage will prop up the branches as they start to sag under the load of ripening fruit, holding them up off the ground and away from slugs and moisture that can cause rotting or spread disease. Indeterminate tomatoes will continue to grow and produce fruit until frost kills them, vining vigorously up a support or across the ground. If you have more garden space than time to garden, you can just space them farther apart (4 to 6 feet) and let them sprawl. They’ll produce a ton of fruit, but it will be harder to harvest, and you’ll sacrifice more of it to pests and diseases. Usually, to save space and keep the fruit cleaner, indeterminate varieties are grown on some sort of stake or trellis. Because these vines can reach 6 or 8 feet tall, the little wire cages sold as tomato supports are rarely able to support indeterminate tomatoes. To provide a strong, tall support, use 6 to 8 foot wood or metal stakes; find a roll of 6 foot fencing or concrete-reinforcing mesh and cut it into sections to form tall, heavy-duty cages around each plant; or assemble bamboo teepees, 7 to 8 feet tall, over each plant. 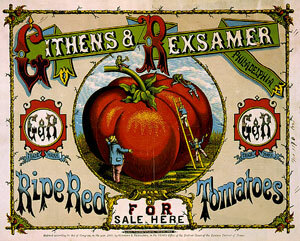 Look around online and you’ll find a variety of methods for supporting tomatoes. When deciding what kind of support to use, consider how much time you have, how many tomatoes you’re growing, the tools and materials available, and how permanent or pretty you want the supports to be. Whatever staking system you choose, be sure to install it when you plant the tomatoes or soon after, to avoid damaging growing plants. As with staking, pruning determinate varieties is more straightforward. It’s generally agreed that these tomatoes should be pruned very slightly if at all. Because they are programmed to produce a certain amount of fruit and then stop, pruning them isn’t necessary to encourage further growth or additional fruit set. In fact, removing blossoms or suckers always reduces the overall number of tomatoes. To improve air circulation and keep the foliage away from soil-borne diseases, however, you can remove all of the bottom branches and foliage, 10 or 12 inches up the main stem. Some gardeners also recommend pinching off the first few sets of blossoms, until plants are well-established in the garden; some suggest removing about half the total blossoms, believing that the fruits left to ripen will be larger and more intensely flavored. Opinions vary widely on how to prune indeterminate tomatoes. Pruning, like staking, is not necessary to produce fruit but will allow plants to ripen larger, tastier, earlier tomatoes and keep foliage up off the ground, with good air circulation to reduce losses to pests and disease. 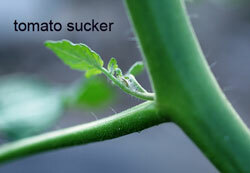 As with determinate tomatoes, you can improve air circulation by removing all branches and suckers that emerge from the bottom 10 or 12 inches of the stem. Most gardeners pinch off all of the suckers below the first fruit cluster, so the plant directs more of its energy into growing taller, setting fruit, and ripening fruit. Above that, some gardeners keep a single vine, pinching off all suckers, while other gardeners leave two, three, four, or more suckers to form vines. Again, it depends on what kind of support you’re using, how much time you have to devote to pruning, and whether you’d like more, smaller tomatoes or fewer large tomatoes. As the weather dries out in June, remember to start watering tomato beds; consistent moisture is especially important as they blossom and fruits start to swell. Get out your drip irrigation system, set up the sprinkler, or hook up a hose for hand watering. Water infrequently (every 7 to 10 days), but deeply (keeping soil moist to a depth of 2 feet or so). If you’re using a drip system or carefully hand watering just under the tomato plants (or if you’ve mulched the bed), you may not have to do much more weeding this season. A sprinkler is easier to set up, but will water indiscriminately, causing more weed seeds to germinate. It also wets the foliage, which can lead to more diseases, especially if plants aren’t pruned for good air circulation. Try to water in the morning or early afternoon if using a sprinkler, so plants have time to dry out before the cool moist evening air sets in. It may take some work, but caring for your tomatoes will help the plants put all their energy into rewarding you with big, juicy, mouthwatering, easy to harvest fruits later in the season. Or, don’t put much work into it, let ‘em sprawl, and still you’ll be able to dig through the vines for tasty treats later this summer!